Dancing with the Stars Season 12 – Who’s Dancing with Who??? Well, we can’t be positive until tomorrow. There have been rumors, per TMZ, of course. Actually, instead of guesses, I’m putting in what I’ve seen on Twitter, either via TMZ or DWTSGossip – stay tuned for the reality tomorrow morning. 🙂 If there was no rumor, I guessed. I have a feeling I’m going to disagree with some of these pairings. I love digging up clues for who’s going to be on, but the publishing of the pairs ruins the fun of guessing. Oh well. Sugar Ray 5ft. 10in. 5ft. 4in. Anna T.
Dancing with the Stars – The Cast of Season 12!!! Most of our readers know that TMZ provided a list of six celebrities and their partners earlier today. I dunno about this cast. Mike is the only one not rumored previously and he’s hot. That’s about all I know about him though. Condoms are good. Malaria ain’t the only disease in Africa. Emily sure is pretty, though. That is all. Wait, not quite. I wonder if they showed monkeys playing on purpose…. I’m falling in love with you. I mean. No, I mean, I really mean it. Seriously. Honestly falling in love with you…..
Ashly, I really have a lot of uncertainty about you, we are very awkard…but please come with me to the Fantasy Suite. The Producers are making me ask you, even though I’m sending you home. Please, people, for the love of all that is holy, do not continually hit refresh on the site during times like this because then *I* can’t get on and that makes me very cranky. Ask my Twitter followers. 🙂 Hitting refresh every 5 minutes just makes it impossible for anyone else to leave a comment or for me to update – hence, nothing to see. Also, if you write a comment and have a typo (Zach), DO NOT write another comment to correct your mistake. PLEASE, PLEASE, PLEASE. Thank you. DWTS Season 12 Cast Rumors – Are These 6 Of the 11 Pairs To Dance? Heidi’s note: TMZ got it right last year, so I’m assuming the celebs, at least, are correct. We called/found 4 of 6 – not bad!! DWTS Season 12 Cast Rumors – Are Wendy Williams and Tony Dovolani Paired Up? Special thanks to PureDWTS reader Carlos Lustosa via @DWTSgossip at twitter and LiesAngeles.com, we have rumors that Tony and Wendy may be paired up to dance on the show. Keep in mind, this news could very well be true (and I hope it is!). But, the two could also be joining other cast members at this location as well (that this person didn’t see before arriving on the scene). The name of this source (Liesangeles.com) has me a little skeptical as well. Dove® and the official Dancing With The Stars site is advertising a new Contest where you can meet actress and former dance contestant Jennie Garth. This contest also mentions the winning contestant will get whisked away to Los Angeles, CA for an intensive week of training with one of the Dancing With The Stars performers. Hmmm, I wonder who that might be? For details and to enter the Dove® Close-up Challenge, go >>>> HERE!! This Contest ends March 26, 2011. Special thanks to PureDWTS reader @Upclose22(Dee) for the heads up on this last night. Fun video promo below…. DWTS Season 12 Cast Rumor – Hines Ward!! Vogue and Courtney, tell the nice readers what I told you a few weeks ago about a Steeler player being on DWTS Season 12. 🙂 If this turns out to be true, my detective work is pretty amazing. For that reason, it probably won’t be. 🙂 Pride goeth before a fall and all that. 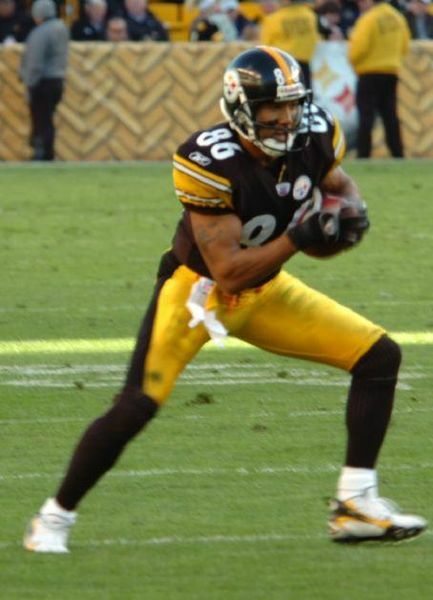 Hines Ward is a Steelers Football player – Wide Receiver, to be exact. Part 2 in my series about the Judges Scoring History covers season 6 of Dancing with the Stars; the season of Kristi Yamaguchi and Mark Ballas (read Part 1 here). Prior to re-watching the season, I remembered it as a season in which Kristi dominated. I don’t think, anymore, that that is necessarily the case. She is still probably the biggest ringer the show has ever cast, when looking at it from a fanbase AND experience point of view, but she didn’t dominate the show in like I remember. I also never got the feeling – like I did with Nicole – that the judges were purposely underscoring her in order to make it look more like a horse race. In fact, I have very few gripes with the judging in this season, period. – Week 5 – The judges essentially raved about Mario and Kristi, while all the rest got constructive criticism. I think the judges gave Marissa an accurate score, but were quite harsh on Priscilla and Shannon. Both of them, in addition to Christian, were underscored, particularly when compared to Marissa. Christian, frankly, was robbed. They gave the encore to Kristi, but I was shocked to realize that, IMO, the best dance of the night belonged to Edyta and Jason. – Week 6 – Here we see, again, a bit of over-scoring – Christian had been in the bottom 2 the previous week, so this week he gets raves on a dance that clearly seemed rushed to me. Again, Mario and Kristi get raves, and Marissa gets handled with kid gloves. Marissa isn’t a “bad” dancer, per se, but she isn’t as good as Shannon or Pricilla. I often think that if you dance better than the judges expect, you get better scores than people who danced better – if those people are expected to dance better. Follow me? Anyway, Mario would have gotten a higher score if not for the lift police. I don’t disagree with the judges and Shannon’s hips (she has none, lucky beyotch), but the words exchanged with Bruno were quite harsh – the look of utter shock on Shannon’s face was hard to look at and that shock is a likely catalyst for what comes later…but more on that later. – Week 7 – This is the week where everyone has one good dance and one not so good dance. And that pretty much sums it up. I would say there’s a trend between this season and Season 5, but it can likely be chalked up to the first week with two whole dances. The only scoring that impressed me as off (other than Marissa) was Jason. As much as I loved him, I thought he was slightly overscored in his quickstep. I just don’t get the love affair they have with Marissa. I mean, she’s not a “bad” dancer, but I don’t think she’s always worthy of the scores she gets. I think she might be getting the “personality” score. – Week 8 – A week later than Season 5, we hear the old mantra of “that was good, but not quite good enough for heading into the semi-finals. Marissa got it, as did Jason on his second dance. Christian did not get the talk, he actually got raves and this was the week after he tore his tendon in his arm. He actually did very well, but I thought that he was not as good as Mario who was scored lower. Kristi got her usual raves although she and Mario both got some flack for their second dances. Kristi because her Samba was “awkward and out of control” – and I absolutely agreed with that assessment. WAY too much stuff in that dance. Mario’s feet were apparently bad or “rough” – but still, better than Christian. While I agreed with Jason’s critiques, there is no way he was 3 points behind Kristi in the second dance. As for Marissa, she is far below the other dancers in terms of quality. This is a random note, but I noticed that Marissa got harder dances, while Kristi got dances that were perfect for her. The dances on this night were determined by “random draw” and I always wonder about those and if they are REALLY random. At the end of the night I also felt that Jason out danced Kristi, even though she beat him by two points. – Week 10 – Jason and Christian are pretty much left in Kristi’s dust. She is the most consistent and technically superior of the three so that’s no big thing. Not much point in discussing the scoring, although I will say that Christian’s injury does catch up with him – I didn’t get the feeling there was underscoring going on to prop up Kristi. As for Jason – the Cha Cha was clearly not his dance, especially not in a “cha cha challenge” where they all dance to the same song one after the other. Not that Kristi needed propping. I predicted as soon as her name was announced that she would win. She’s *Kristi Yamaguchi* after all. Season 6 Summary – On finale night, Christian is announced as 3rd place before there is anymore dancing. After that, both Kristi and Jason are given perfect 30’s – pretty safe, since Kristi is still 9 points ahead. I didn’t note whether I found Jason’s score to be valid or not, since it really didn’t matter at that point. No one is going to over come a 9 point lead against Kristi. That’s not to say the scores weren’t valid – they were. I had very few problems with how this season went down. No real surprises. No shocks. They did make a point, from time to time of saying that a dance wasn’t up to par for a given point in the season – which is how it should be. Christian and Jason’s bromance is the sweetest thing about this season. Kristi wasn’t the phenom that I remember her to be. She’s very, VERY good, but I actually enjoyed Christian and Jason more, from an entertainment standpoint. Week 8 this season was the first non-bottom 2 reveal. I’m waiting to see what season they do away with it altogether and if it becomes obvious WHY they do it. Mark DIDN’T have polka dots in Kristi’s 1st Jive costume other than her hair bow – yes, you know this is remarkable if you’ve been paying attention. He did succumb to the polka dots for their jive in the semis. Derek hurts his neck, then gets food poisoning, then has a meltdown with Shannon the confessional – who was saying he’s never been challenged?? 🙂 Anyway, the meltdown – they apologized over and over and over and both seemed to regret it. Somehow, that got lost in the discussions of the subject well after the fact. This season had one of the great Pro Dances that seem to have faded away in the seasons since. Tonight is Oscar night and several of our Pros have been attending some of the Parties. Peta and Damian can be seen at the Dare To Care party HERE. Tony and Maks can be seen below at the Rolling Stone Party. More pics of the duo and more at Zimbio. Tony and Cheryl are especially interested in the Awards this year since they helped choreograph a sequence in the nominated movie “Toy Story 3”. Take below from Kgoam810. Cheryl and her fellow Dancing with the Stars pro Tony Dovolani choreographed the lighthearted Latin dance sequence between Buzz Lightyear and Jessie the Cowgirl that ends the film. Not only that, but the characters’ movements were actually animated versions of their own moves. Be sure to tune in tonight to see if Toy Story 3 wins. Cheryl has also remarked at her twitter that she plans to attend.